Tyler Cowen sees uncomfortable paralells with World War I. The more I've thought about it, the more I think he's right, in the sense of smaller power-tails wagging greater power-dogs into a war nobody really wants (perhaps I'm being too charitable) but nobody can figure out how to avoid. 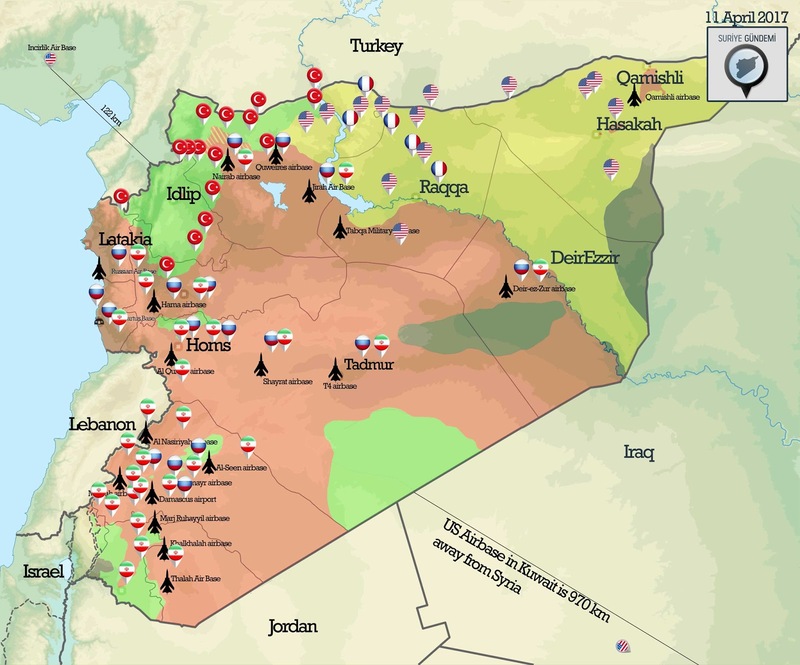 Here's a map of domestic and foreign military installations in Syria. Here are the areas of control. Here's where the oil is. Not a lot, but enough to provide a real shot in the arm to a Greater Kurdistan. By the way, every Syrian I've ever met despises the Kurds. The French and the British gave them the place, the French and the British didn't carve out a Kurdistan, and the Syrians remember the boundaries of Greater Syria even if you don't. 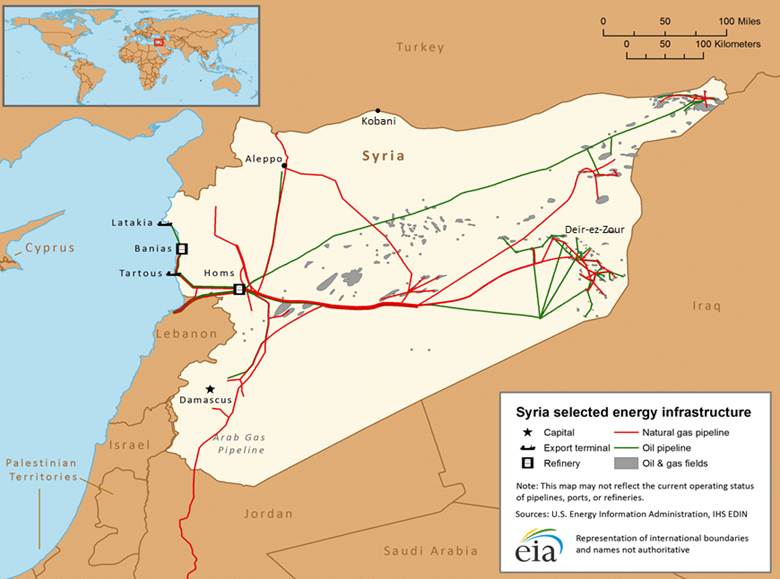 The Turks have no interest in a landlocked Kurdistan with oil either. Israel has apparently launched its own strikes, and here is where things could get problematic. Israel considers Iran and Hezbollah existential threats, and their presence in Syria seems intolerable to Israel. So let's say Israel decides, now that the US, Britain and France have their casus belli, to rid themselves of this existential threat next door. Iran and Hezbollah retaliate and we slip very quickly into a hot, cross-border conflict. Resurgent nationalist Syria, seeing its very existence slipping away, rallies its troops for yet more fighting. The Lebanese Army, an astonishingly neutral force so far, has no choice but to fight alongside the Hezbollah mini-state. There is no way the US and its large Zionist and Evangelical constituencies sit on the sidelines at this point, and the Arab monarchies (who hate Iran and Hezbollah as much as Israel) lend their support as well. Russia either capitulates and slinks away or allies with Iran and Syria. Probably the latter. The Turks finally do what they've wanted to do for decades: kill Kurds, who of course call on the US for help. Turkey is a NATO member with US nuclear weapons on its soil by the way. Non-state diaspora from all sides engage in terror attacks elsewhere. Hundreds of thousands--millions--flee the region. There are massive protests. World trade shrinks, debt balloons, 401k's crater. I churn out endless posts about how right I am about everything. From civil war in a single country to theater-wide total warfare in a few simple steps. Presumably, smarter people than me are thinking about this too, and working hard to avoid such a nightmare, right? Right? I overlooked a Pascha greeting this year as I was blessedly busy with other matters. We should be mindful of the season and pray for peace. We are closer to World War III than we think.